San Francisco — Gallery Wendi Norris is pleased to present Shadowtime, the third solo exhibition with San Francisco-based multi-media artist Ranu Mukherjee. 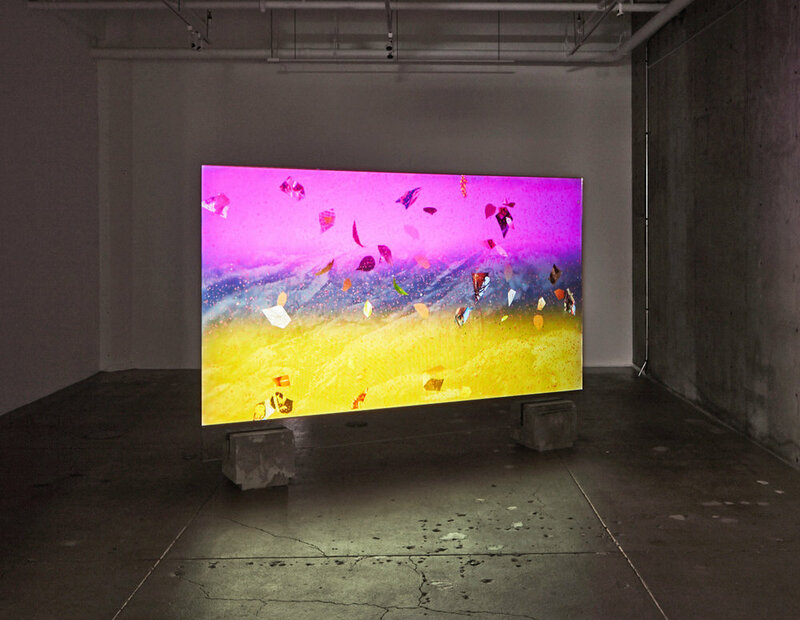 Shadowtime unveils a series of new yellow, orange, and purple milk paintings on paper and a hybrid film installation, projected on a 107 x 60-inch sculptural glass screen. The paintings, varying in scale from intimate to larger-than-life, debut a new style of mark making for Mukherjee. The brightly colored and near-abstract compositions incorporate layers of gestural lines evoking immediacy and movement. At first glance, the paintings appear as collections of colorful fragments. Made up of seemingly knotted entanglements, they deny the viewer immediate comprehension of specific subject matter. However, from vibrant tangles and clusters, narrative and contradicting imagery unfolds. Scenes of lovers embracing, ice sheets cracking, and masses of people in protest or prayer reveal themselves with relatable complexity. This exhibition will also introduce the artist’s newest hybrid film installation, Mixing Dusts. As artist-in-residence at the de Young Museum, Mukherjee recorded pairs of participants rolling on the ground while hugging. This action, both difficult and intimate, describes movement and love in an unsteady world. This footage, animated atop fragments of shifting groundcover, portrays expressions of love made incongruous by an underlying sense of apocalypse and uncertainty. In order to capture the feeling of being a multi-racial artist in a precarious environment, Mukherjee collaborated with the Bureau of Linguistic Reality to coin the term, “Shadowtime”. “Shadowtime” conveys “the feeling of living simultaneously in two distinctly different time scales.” An additional definition is “the acute consciousness of the possibility that the near future will be drastically different than the present.” “Shadowtime” becomes a noun about unknowing. It expresses the cognitive dissonance of equally possible yet divergent futures. Layering images of natural disasters and exodus the artist personalizes incomprehensible fear with undeniable notions of hope and love. This exhibition is complemented by two public programs including an artist conversation lead by with Saisha Grayson, Ph.D. candidate, The Graduate Center-CUNY, and former Assistant Curator at the Elizabeth A. Sackler Center for Feminist Art at the Brooklyn Museum. The exhibition closing reception features Now not Now, a newly commissioned dance performance by Hope Mohr Dance. Inspired by physical movement, Mukherjee invited Hope Mohr Dance to create and premiere a new movement-based performance for three people, inspired by and based on the Shadowtime exhibition.